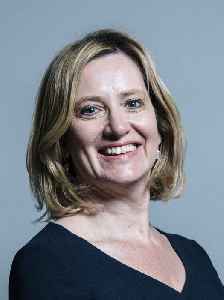 Amber Augusta Rudd is a British politician serving as Secretary of State for Work and Pensions since 16 November 2018. A member of the Conservative Party, she served as Home Secretary from July 2016 to April 2018. Rudd was first elected Member of Parliament (MP) for Hastings and Rye in 2010. She identifies herself as a one-nation conservative, and has been associated with both economically liberal and socially liberal policies.